As we enter into the heart of the autumn season, two more lives have been added to our community while I, Sarah McMahon, continue to move forward on the path of becoming formed as a Missionary Benedictine Sister of Tutzing. 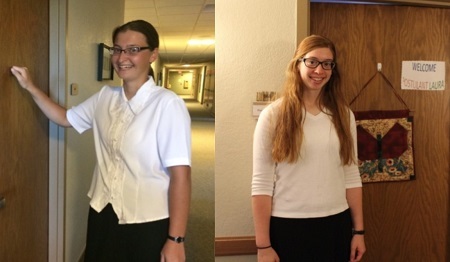 Laura Haschke and Elizabeth Haag were accepted as postulants in the Norfolk Priory on September 17, 2016. This has definitely livened up the novitiate area of the monastery as it was previously only occupied by me throughout my canonical year of novitiate. Our 131st Foundation Day, September 24, marked the end of my canonical year. I have been blessed to have a quiet, prayerful year in the monastery. I look forward to moving into a variety of ministries this fall, both inside and outside the monastery, as I also learn to live with hall mates once again after a year of being an “only child” in the novitiate. One thing that I have learned during novitiate is that life is constantly changing and one best copes with these rapid changes by having an attitude of flexibility. I pray that I have learned enough to be a good model for our two young postulants as we all discern God’s will together as we begin to live the Benedictine way of life. Our new postulants have also had a brief time to reflect on what their entrance into the Benedictine way of life has meant to them. Here is a little note from each.